If you’re not using mulch in your vegetable garden, you’re doing entirely too much work. Mulch helps to hold in moisture, so you don’t have to water as often; it shades out weed seedlings, cutting down on weeding time; and it composts into nutrients and amendments for the soil. Straw is one of the best mulch materials you can use around your vegetable plants. It’s clean, it’s light and it breaks down relatively easily, giving your plants more of what they need to grow. Let’s find out more about using straw mulch for gardening. The first key to using straw as mulch is in finding the right types of straw garden mulch. Some straw mulches may be mixed with hay, which can weed seeds that can sprout in your garden rows. Look for a supplier that sells guaranteed weed-free straw. Rice straw is very good, as it rarely carries weed seeds, but wheat straw mulch in gardens is more readily available and will work just as well. 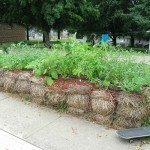 How to use straw mulch in the garden is easy. Bales of straw are so compressed that you might be surprised at how much of your garden one bale will cover. Always start with one and buy more if it’s needed. Place the bale at one end of the garden and clip the ties that run around the bale. Insert a trowel or sharp shovel to help break up the bale into pieces. Place the straw in a 3- to 6-inch layer in between the rows and between the plants in each row. If you’re growing a square-foot garden, keep the straw to the center aisles between each garden block. Keep the straw away from the leaves and stems of the plants, as it may spread fungus to your garden crops. Straw will compost pretty quickly in most garden settings. Check the depth of the layer in between rows after about six weeks. 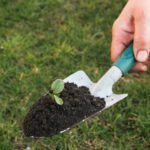 You’ll probably need to add another layer, to the depth of 2 or 3 inches, to help keep the weeds down and moisture in the soil during the hottest part of summer. If you’re growing potatoes, straw is the ideal way to hill the area around the stem. 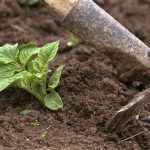 Usually when gardeners grow potatoes, they hoe the soil around the plant and pull loose soil into a hill around the potato plant. This allows more potato tubers to grow along the stem underneath the soil. If you pile straw around potatoes instead of hilling up the soil, the potatoes will grow cleaner and be easier to find at the end of the season. Some gardeners avoid using soil at all for their potato plants, and just use successive layers of straw added throughout the growing season.